Journey of Cancer Research Project | Cancer Research Project - Ayurved Hospital and Research Center - Bharatiya Sanskriti Darshan Trust . :Ayurveda for Cancer:. After a lot of discussions among Parampoojya Sardeshmukh Maharaj, Dr. Arvind Kulkarni and Dr. S. P. Sardeshmukh and pre clinical study, it became fully operational in the year 1994. The project is carried out at three centers at Pune, Mumbai and Solapur under the able guidance of Prof. Dr. S. P. Sardeshmukh. The project is coordinated by Dr. Arvind Kulkarni (Ex–HOD, Radiation Oncology Dept. Bombay Hospital, Mumbai) at Mumbai and Pune centers. For the Solapur center a well known onco surgeon Dr. Shirish Kumthekar is co-ordinating the project. Up to now more than 10000 patients suffering from various types of Cancer and being at different stages are included in this project. “Cancer” a dreaded word in the field of medicine. The word itself evokes fear, anxiety and tension in the minds of patients as well as relatives. Research is being carried out all over the world to cure this disease but it is still uncertain to come to any conclusion. In such a scenario Parampoojya Sardeshmukh Maharaj felt that research should be carried out to establish the efficacy of ayurved the ancient science in giving relief to the patients suffering from Cancer. The corner stone of the project was laid in 1986 by Parampoojya Shri. P. K. Sardeshmukh Maharaj with the inspiration from Shri. Balasaheb Bharade and Mrs. Indumati Bharade. Ex-Patients who were taking ayurvedic medication along with conventional treatments had encouraging results. Since 1986 various meetings and discussions were held to chart out the project, to have a scientific base. In 1994 the project finally took shape. It was decided that the patients having confirmed biopsy reports would be registered in the project. They would be divided in four groups based on the treatment options. A detailed case history would be noted. The medication would be given and results assessed on medical parameters. A press conference was held. It evoked a tremendous response. 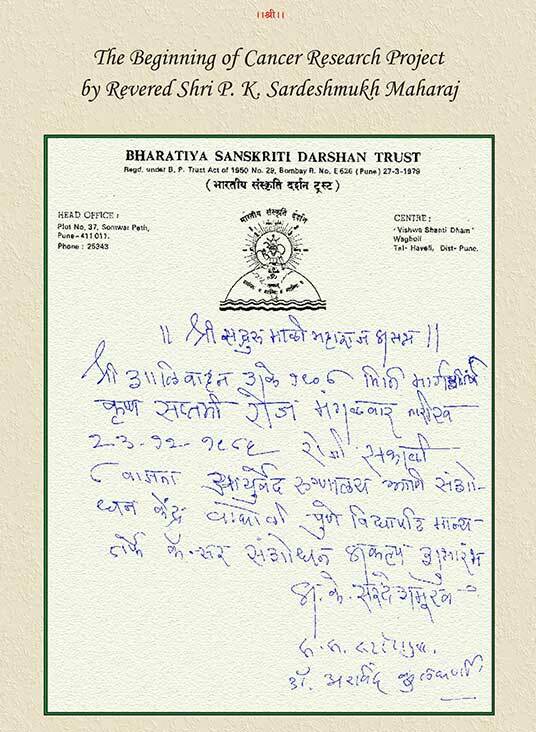 The ‘First Camp’ on Cancer was held at Pune on 25th March and in Mumbai on 27th August 1994. People from far and wide came with a hope. The earlier cases registered in the project were mostly in the terminal stages where not much could be done. But now as the years pass by their has been a significant change in the mindset of the people. People are turning towards Ayurved for better quality of life. In 1995, it was decided that a center for this Research Project should be started at Solapur, the hometown of Parampoojya. 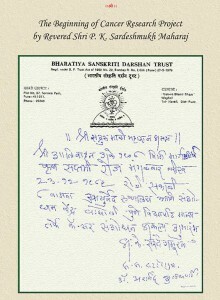 Sardeshmukh Maharaj. Dr. Shirish Kumthekar an onco-surgeon at Solapur readily agreed to work as the co-ordinator of the project. Gradually the project started gaining momentum. In 1997, International Conference on “Ayurved for Cancer” was held to put forth the work done on Cancer in the field of Ayurved. Scientists from various countries participated in this conference to present their papers. The research papers were published in form of “Ashwasana”. After five years from the Ist Conference in 2002, IInd International Conference on “Ayurved for Cancer” was held at Pune. Research papers were presented by Ayurved Hospital Research and Development on its work regarding Cancer. In this conference, an exhibition on Cancer and Ayurved was held to create awareness regarding the disease, fight against it and its preventive measures. Many a times patients are worried and confused. They are not sure whom to approach to get their queries solved. Taking this aspect in account, an open session “Fight against Cancer” was organised. The papers presented at the conference were compiled and published by the trust in the book “Ashwasana”. Based on the research uptil now, a book “Cancer-Ayurved” has also been published by the trust in Marathi. During our journey towards fight against Cancer, we felt the need to evaluate the efficacy of Panchakarma treatment. For this treatment, patients are admitted at Ayurved Hospital. In the year 2004, this project completed a decade. To commemorate this occasion, a Cancer Decade Program was held at Mumbai, Pune and Solapur. Patients suffering from this disease spoke about their experiences and gave a moral boost. A brief overview about the journey of project in decade was taken. In the year 2007, ‘IIIrd International Conference’ was held which proved to be a milestone in the Research Project journey. Experts from different pathies working for Cancer patients attended the conference and contributed their approaches towards Cancer and ways to overcome it. The journey still goes on. Along with camps, an exhibition about Ayurved and Cancer is also held every year. Open sessions are also held. We have still got a long way to go. With the blessings of Parampoojya Sardeshmukh Maharaj, guidance of experienced doctors we work our way further in trying to win a war against Cancer. In 2009 Department of Atomic Energy, Government of India has given us grant in aid for purchase of Cobalt Radiotherapy Machine to start the Radiation Treatment in our Centre at Wagholi, Pune. In the same year Department of AYUSH (Ayurved, Yoga, Unani, Siddha, Homeopathy), Government of India has given us grant in aid to construct this unique “Integrated Cancer Treatment & Research Centre” at Wagholi, Pune. In the year 2011 Padmavibhushan Mr. Ratanji Tata Visited Our centers in Mumbai and Pune. After which Jamshedji TATA Trust has given us grant in aid For construction of Panchkarma Building in Wagholi, Pune. In May 2011 another Proud occasion took place, Her Excellancy Hon. Presidant of India Smt. Pratibhatai Patil for inaugurated the Integrated Cancer Treatment & Research Centre at Wagholi, Pune. Excellancy Hon. President of India Smt. Pratibhatai appreciated the efforts of Trust in the field of Cancer Research & Treatment.